PERSONALITY: A Mysterious,Nerd,Lazy,Tsundere,Yandere,Grumpy Girl. She doesn't get along with other people except for Mia the Hedgehog (oc from [iconname]HanyNAR[/iconname] the ship has sail! XD) Also a former Assassin. ABILITY: A Skillful Sword woman and a Martial Arts Expert. DISLIKE: Drama,Disturb her while she reads. She's a psychopath when it comes to battle especially on powerful opponent(she join the assassin at the age of 5) or hurting Mia the hedgehog(she's like a sister to her) she does get along with Sonic and the others but she's like shadow kinda an anti-hero. She's kind but doesn't show it except for Mia,Cream and cheese. 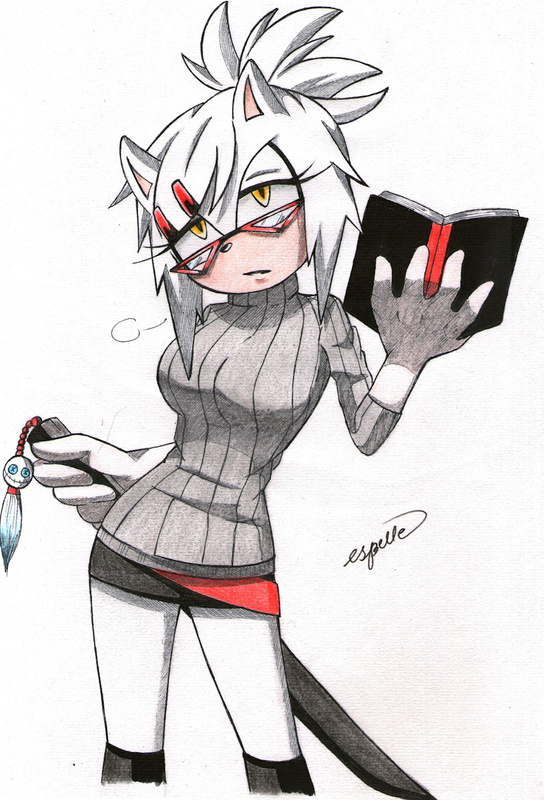 She hated other calls her by her nickname it annoys her or cringe her except for mia.XD Loves books so much! She can even read 5 books a day. SHE'S MY FIRST MOBIAN OC! HOPE YOU LIKE HER! Can i "smash" dat Gothicass?